This title deals with the art of likeness. It focuses on the spectrum of today's portraiture, from caricature to realism. The field of illustration has flourished over the last decade, with professionals working both by computer and by hand. In illustration, the single most challenging and captivating subject has been the portrait, frequently used in editorials, advertising, products, and most recently, being the subject of major exhibitions. 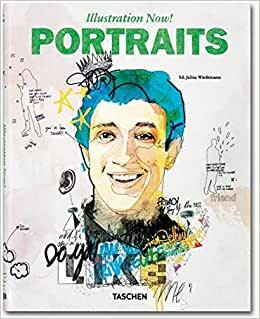 The book gathers together the exclusive (and frequently unpublished) portrait work of over 80 illustrators from all over the world, many of whom were featured in "Illustration Now! ", including Aaron Jasinski, Alex Gross, Andre Carrilho, Andrea Wicklund, and Anita Kunz. Julius Wiedemann was born in Brazil, studied graphic design and marketing, and was an art editor for digital and design magazines in Tokyo. His many TASCHEN digital and media titles include Illustration Now!, Advertising Now, Logo Design, and Brand Identity Now! 5.0 颗星，最多 5 颗星Great book of modern day portraiture. Great book. It's so big not in size but girth. It's about 570 pages of various styles of modern day portraiture. If you love art, modern, pop and surrealism of various styles you'll love this book. Just looking at the pictures I had to view it through a few sittings.and i still seem to find things i missed earlier. Filled with great artist and illustrators and plenty of celebrity portraits also. Wonderful book. This is an excellent resource with variety of illustrators from all over the world. Prompt service. The book included so many portraits from different artists in different styles. You will learn from these arts and create your own style. 5.0 颗星，最多 5 颗星Great illustrations of artist's portraits! Used this book to study portraiture.